Four times 4 is 16. Sixteen times 4 is 64. So, 4 • 4 • 4 = 64. In our example, the 4 is called the base, and the is called the exponent. 1. How would 3 • 3 • 3 • 3 • 3 be represented in exponent form? 2. How would 2 • 2 • 2 • 2 be represented in exponent form? 3. How much is ? 4. What is the exponent in the number ? 5. What is the base in the number ? Rule 1: Any number raised to the power of 1 is equal to that number. Rule 2: Any number raised to the power of zero (except zero itself) equals 1. Let’s practice. Select the answer to each problem below. Rule 3: When multiplying numbers with the same base, the exponents are added. This shows us that our rule works. We get 32 by applying the rule and also by working out the multiplication. Rule 4: When dividing numbers with the same base, the exponents are subtracted. This gives us the same answer, so we have proved that the rule works. Do you know how far away the earth is from the sun? 93,000,000 miles! Do you know the mass of the earth in kilograms? To work with such large numbers without writing all these zeroes, scientists came up with a shorter method. This method is called scientific notation. To make the scientific notation of a number, you put a decimal point after the first digit and remove all the zeros. This first part of the number is called the coefficient. This number must always be greater than 1, and less than 10. The second part of the number is known as the base. The base is always 10 for scientific notation with an exponent. The exponent is determined by counting all the digits to the right of the decimal. 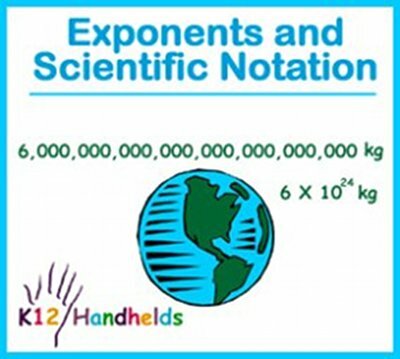 To change a number from scientific notation back to standard form, just move the decimal to the right the number of places of the exponent. 16. In scientific notation, what is the coefficient for the number 831,000,000? 17. What is the exponent for the number 831,000,000? 18. In scientific notation, what is the coefficient for the number 214,000,000,000? 19. What is the exponent for the number 214,000,000,000? 20. How is this number written without scientific notation (in standard form): ? 21. What is the base in any number with scientific notation?